Mark Gritter, founder and chief architect at Tintri, we met with The IT Press Tour in March 2012, left the company after 11 years to join Hashicorp. He joined recently DDN he didn't mention in his departure message after the storage giant swallowed and saved the company asset, installed base and IP following Tintri IPO disaster, business and financial difficulties. He will become Vault Advisor for the Hashicorp Vault project. 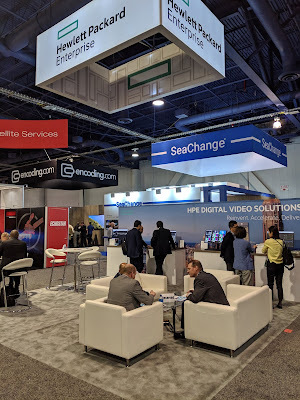 NAB (National American Broadcaster) Show was, once again, a gigantic expo with around 100,000 attendees representing 160+ countries and 1600+ exhibitors. As said in the past, Media and Entertainment is a large market segment for the storage industry. More and more greedy in capacity, now in-cloud media processing and operations, distribution and live streaming, networks bandwidth, complex media workflow, sophisticated editing and image/video processing, frequent movie production plus recent development in VR, drones and even IoT applications, all these illustrate the key role of storage in that industry. 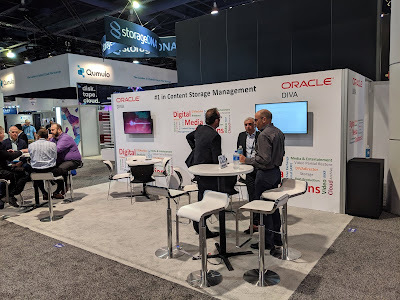 Following 2018, Oracle and HPE have seriously decided to have a serious presence demonstrating solutions, I let you check the photos below. On the other hand, Cisco, IBM and Dell had decent booths promoting intelligent comprehensive workflows respectively with IBM Spectrum Scale and Dell EMC Isilon. IBM has insisted a lot on solutions around Watson and Aspera. We also anticipate some news soon about IBM Cloud Object Storage. We navigated in AWS, Google and Microsoft booths, growing their footprint every year with in-cloud media management and processing. We met Ron Bianchini, former CEO and founder of Avere Systems, at the show confirming the perfect fit of its NAS accelerator in such projects. Don't forget that Pixar is an Avere customer for many years now, swapping their back-end filers almost for every movie in production but keeping their first-tier Avere NAS. Other cloud storage vendors were there like Backblaze for B2 and Wasabi announcing their Media Innovation Cloud Alliance. We met Acembly on Wasabi booth speaking about a interesting cloud data management approach. and the SAN file sharing heritage what we call today asymmetric [parallel for some of them] distributed file system with the need to install a piece of software (agent, driver…) on clients as the file system exist between consumer i.e clients and producers i.e servers. It’s the case for Acelstor with MooseFS, Avid with Nexis, DDN, Dynamic Drive Pool aka DDP, EditShare, Facilis with HUB, Harmonic with MediaGrid, ScaleLogic, Quantum with StorNext, Quobyte, Rohde & Schwarz with SpycerNode based on IBM Spectrum Scale or Tiger Technology. Secondary storage was also present in different flavors, tape vendors like Spectra Logic, Qualstar, we even visited the LTO consortium booth, data management specialists such Komprise, Atempo, StorageDNA or XenData, secondary disk solutions like Disk Archive, Nexsan, StorByte or Seagate promoting TapeArk solutions and many server vendors and object vendors like Caringo, Cloudian, DDN, Masstech, Object Matrix, Pure Storage or WDC but now also Qumulo with the Minio announcement. 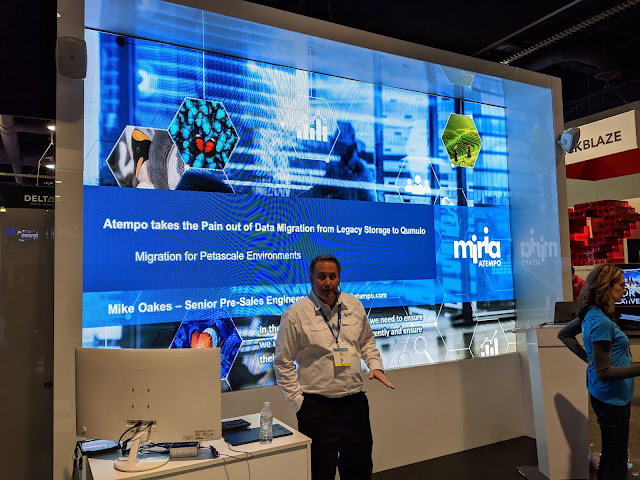 We noticed the presence of Atempo with its new visual identity promoting Miria and its data migration service already adopted by Huawei, DDN and more recently Qumulo. Mellanox was also there with a small booth showing their Ethernet Media Fabric model. and Western Digital with new G-Technology portable drive. Fivetran, a data pipelining for data warehouse, recently met by The IT Press Tour, just announced at Google Next'19 a huge news: a partnership with Google Cloud to offer a Data Transfer Service aka DTS for Google BigQuery, based on Fivetran. This is a big accomplishment for the startup. It follows some recent market moves in ETL segment such Stitch acquired by Talend in Nov. 2018, Alooma by Google in Feb 2019 and Attunity by Qlik also in Feb. for $560M. This agreement with Google reminds me the one signed with Trifacta illustrating that Google selects top products. Google goal is to enrich BigQuery solution with several products around it and strengthens the user experience without the need to "exit" the environment. The current integration supports connectors for 100+ sources inluding Saleforce, Marketo, NetSuite and the list is an going development for Fivetran. The momentum is real and we anticipate a fast acceleration for Fivetran following this partnership. Congrats. Qumulo, the obvious leader in file storage for M&E, we can say that without any doubt, makes an other key announcement following the one last week related to CloudStudio, CloudContinuity and GCP support. You can refer to this post for more info. New hardware appliance C-72T (1U) for nearline archives being denser and faster than existing ones, starting at 144TB raw, clusterizable with 5 other nodes. The company has also published some very compelling performance results reaching a new level of price/performance and price/capacity ratios. Images below illustrate performance gains. New permission model to support file access protocols across heterogenous platforms. This new module named XPP for Cross-Protocols Permissions offers to users a similar model to access files even if they comme from MacOS, Linux or Windows environments. It reminds the acquisition of Likewise by EMC early 2012 for approximately $37 million to offer a similar approach between Unix, Linux and Windows environments as Isilon ran a Samba flavor for CIFS services. New S3 storage service with partnership with MinIO. 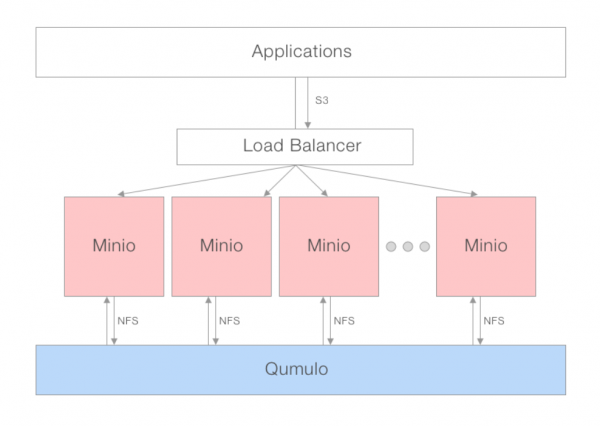 Qumulo has selected MinIO, the obvious S# on-premies object storage. Here it works as a gateway on top on NAS so none intrusive at all et very easy to deploy and it is super fast. A tutorial is available here. Honestly, they can't select any other player as they wish a serious offering. Qumulo accelerates for several months now addressing new uses cases, joining new verticals with deeper integration and add key new features. Azure should arrive in a few months and the picture will even more comprehensive. Qumulo, a leader in scale out NAS, continues to expand its cloud coverage now with Google Cloud Platform GCP support in addiiton to AWS and we expect soon Azure. CloudStudio is a new product announced at the same time and we'll see it at NAB next week some demo, it's a vertical solution powered by Teradici and integrated with famous established M&E tools. The company also joined The Open Group Open Subsurface Data Universe™ (OSDU) Forum indicating that the company really wishes to offer deep integrated solution with clear value. Qumulo has also decided to name its replication feature CloudContinuity, this is what we have named a few months ago AACR for Automatic Asynchronous Continuous Replication, working with on-premises, AWS and GCP. With NAB and Google NEXT coming, Qumulo will be interesting to meet and discuss with. We'll do. Pure Storage is serious about file storage confirming it strategy by acquiring Compuverde a few months after StorReduce acquisition. I have discovered Compuverde in 2012. Started with FlashBlade as an on-premise enterprise file and object storage product exposing NFS and S3, Pure Storage recognized market needs for a cloud file storage flavor. Selecting a multi-protocol SDS product like Compuverde is clearly a good sign in such journey and we expect soon a presence in AWS, GCP and Azure, at least we hope, like the Cloud Block Store introduced a few months ago on AWS. IoT data volume explosion and RedisAI to process data in-place without any migration to/from external AI engines. RedisAI integrates now deep learning frameworks such TensorFlow, PyTorch and TorchScript. 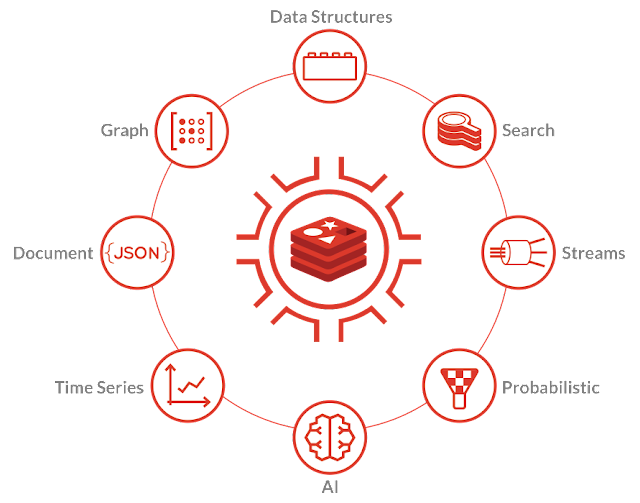 And finally RedisGears, an in-database serverless engine, that delivers a very comprehensive data model database with search, graph, streams, AI, timeseries, document and probabilistic data structures. And the company extends CRDT - Conflict-free Replicated Data Type - usage with active-active approach, key point for multi-cloud and hybrid adoption. It's important to refresh readers with CRDT roots, it was started at INRIA in France in 2011 by March Shapiro team and adopted by a few vendor like Redis Labs but also Basho for Riak, Microsoft for CosmosDB ro Facebook for ApolloDB. 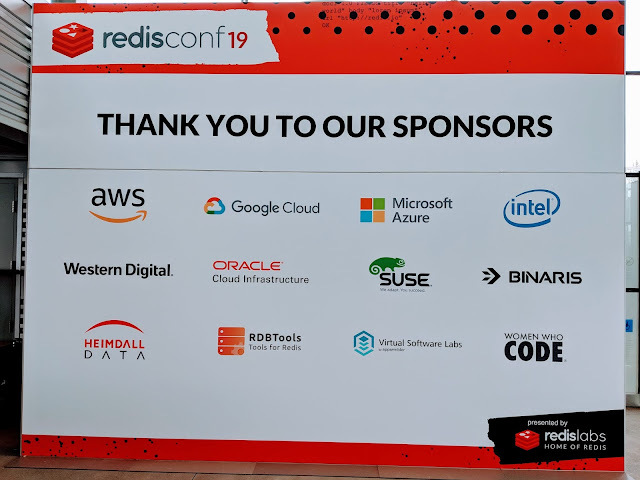 Lots of use cases, product and partners presentations during this RedisConf, a superb conference I invite to consider next year. Promethium, an emerging player in data governance and analytics, met recently the IT Press Tour for a very interesting session. Founded in 2018 by Kaycee Lai we already met at Primary Data and Waterline Data, the company has raised $2.5M from Zetta Venture Partners, Generation Ventures and others. 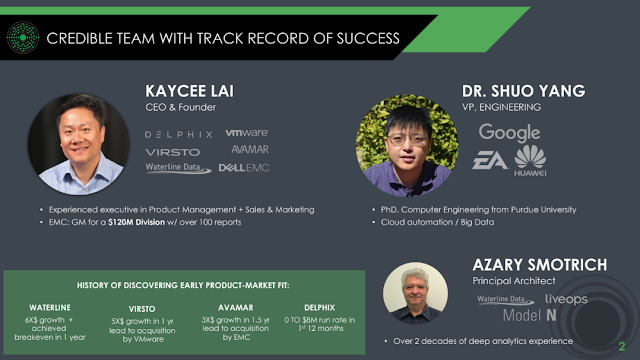 Based on his own experience and time at these companies including Delphix, he realized that there is a missing piece in data governance. The other founders are Dr Shuo Yang, VP Engr, who worked at Google, EA or Huawei, and Azary Smotrich, principal architect, who also spent some time at Waterline Data. And to close the loop, the name Promethium is related to the chemical element, its symbol is Pm, atomic number 61, very rare with 500-600g on earth. It explains the name of the domain name of the company pm61data.com. The volume of data coming from various sources and the competition advantage they represent have impacted the industry in such a way that having fast, super fast, insights become a fundamental business component. 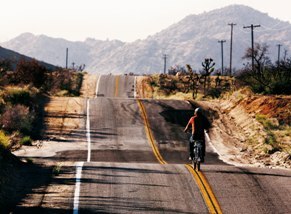 But this is a mission like finding a needle in the haystack. The 5 first steps described above are tough, take time and error prone. During all this time and effort, data are not validated, not guaranteed to be accurate and in case of divergence, it implies a direct loss of time with a potentiel business impact. At the time where fast insights are a key competitive advantage, the battle is lost and such approach can't satisfy current users. 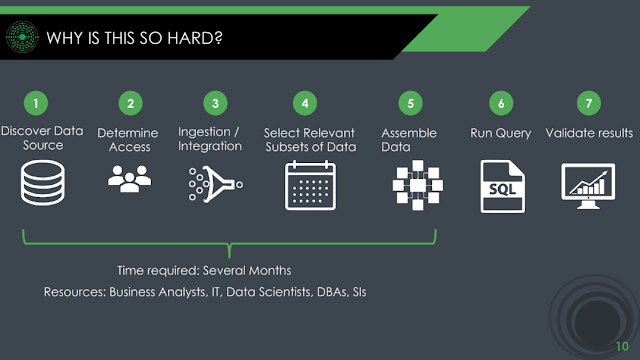 With the BI tool, Data Warehouse and more recent data scientist wave, the industry realizes that 70% of the bI TCO is in labor according to a recent Tableau study. It means that among the 3 components - technology, process and people - the last 2 elements continue to represent a heavy portion. The idea of Promethium is to address these 5 steps impacting the global experience and reduce them to 2 thus compacting the time to answers. The 1st step is about Questions to select the right and accurate data plus a second step to retrieve data from various sources. So we understand the 1st step is a core component of the solution illustrated by the slide below and reduces drastically the time consumed with other solutions. Promethium said this time drops from several months to a few minutes, so a spectacular return. The other key attribute is the automation approach avoiding human long interactions that impact these steps. The second value beyond time is the improved accuracy meaning that you can enrich the model to cover more data for just a few more minutes. It was impossible with classic approaches. 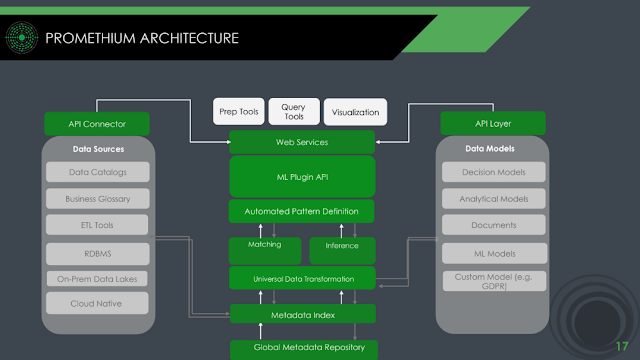 Promethium architecture is super flexible leveraging standards, ML, metadata indexing techniques, API integration and web services to automate the global process. Among the data sources, classic ones of course such databases like MySQL, Oracle, Teradata, Hadoop from Hortonworks or Cloudera, Aurora... files of course in multiple format. The company has identified 3 use cases to start: Pre-analytics, Dat Governance and Project Prioritization. The solution is very promising. We hope to meet again Promethium during a future edition of the IT Press Tour to learn more from end-users deployments, ROI and business values. Hazelcast, an emerging in-memory computing leader, extends its solution coverage with Hazelcast Cloud. Until now, Hazelcast sells two products: IMDG aka In-Memory DataGrid and Jet to be deployed on-premises. Designed to deliver very fast performance with very low data access latency, IMDG is now a recognized well adopted product for high demanding applications, we can say business applications with HPC-like constraints. Jet, more recent, targets stream and batch needs. With its cloud flavor, Hazelcast now offers a real answer to enterprises wishing to run business applications in the cloud. As said by Kelly Herrell, CEO of the company, a few days ago when The IT Press Tour met the team: "latency is the new downtime and microseconds matter". This new offering is presented in 3 editions: Hazelcast Cloud (FREE), Hazelcast Cloud and Hazelcast Cloud Dedicated. The FREE option is designed for test and development, and the paid option, based on same technology, adds always-on status, higher memory limits and of course customer support. AWS is available now, Azure and GCP will be released before the end of the year. These two editions are operated by Hazelcast as a managed service. 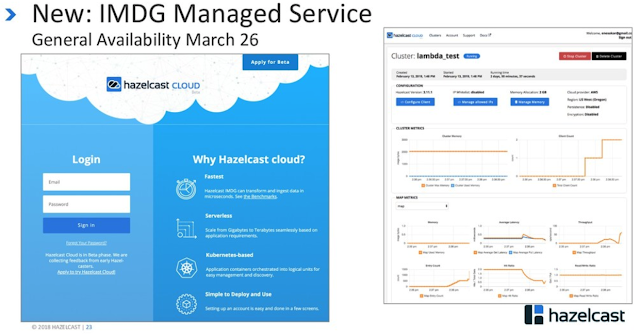 The last product iteration - Hazelcast Cloud Dedicated - is a reserved for private cloud deployment but configured and maintained by Hazelcast and should be appear mid-year 2019. The cloud offering leverages 3 components: IMDG, Kubernetes and Docker. Hazelcast seems to engage a direct competition with its close competitor GridGain and this one announced its cloud option last January.